If revenues are any sign of economic health, the economy is in the best shape in years. For the 12 months ending 2012, revenues from all 50 states and DC from state and local taxes totaled $399 billion, up $97 billion from the previous period, according to the latest census. The chart below shows the tax revenues for the states for the latest 12 month period, in millions. Louisiana received most of its tax revenues from individual income taxes in 2012 with sales tax receipts a close second. There is a wide gap between revenue sources; for example, revenue from property tax in Louisiana totaled only $12 million which includes commercial real estate. 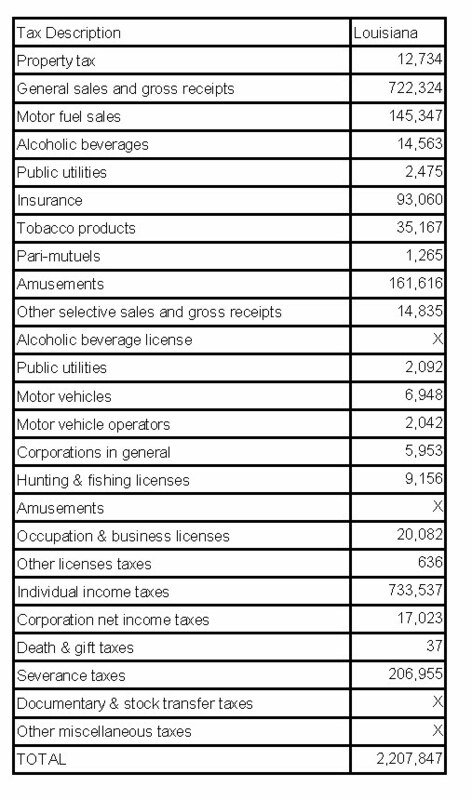 Notice how little revenues are received from corporate income taxes and documentary taxes. Expect to see Governor Jindal introduce legislation to capture some of these missing revenue streams. Louisiana received $206 million in severance taxes, which is the oil and gas industry, ranking 5th behind Alaska at $1.3 billion, Texas at $1 billion, North Dakota at $332 million and New Mexico at $209 million. Louisiana’s revenue sources differ from even neighboring states. Alabama received $68 million in corporate income taxes compared to Louisiana at $17 million. Florida received $467 million from documentary taxes compared to Louisiana’s figure that was too little to count. How the state taxes varies widely from other states and, as the table below shows, there are many revenue streams available. 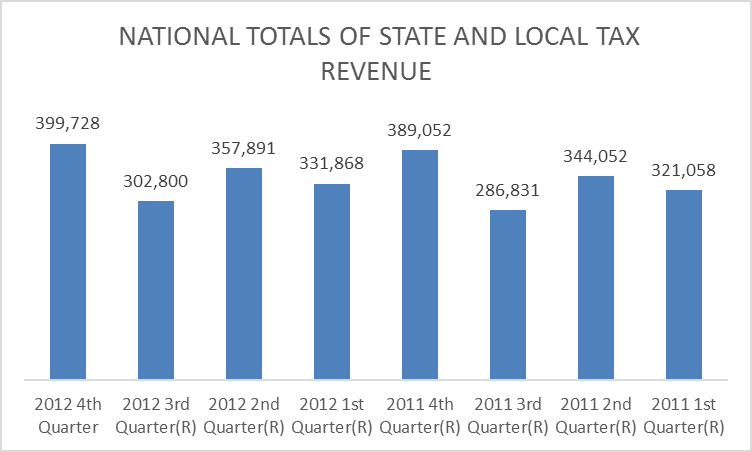 Source:www.louisianacommercialrealty.com; Summary of State and Local Government Tax Revenue: 4th Quarter 2012 — This summary shows quarterly tax revenue statistics on property, sales, license, income and other taxes. Statistics are shown for individual state governments as well as national estimates of total state and local taxes, including 12-month calculations. This quarterly survey has been conducted continuously since 1962. Internet address: <http://www.census.gov/govs/qtax/>.